Is shade a problem for solar panels? It can be. In most cases it can be addressed, but if your house is not a good fit for solar, our energy specialists let you know up front. Shading can be a problem for PV systems because of the wiring design of string-inverter systems: If some of the panels on a string are shaded, the energy output of the entire array is drastically decreased. If shading cannot be avoided, a simple solution is to use microinverters that connect the system’s panels together as pieces, instead of as a whole, so that only the shaded panels will be affected during the shade times. For pool solar, if moderate shading around your home can’t be avoided, a simple solution is to add additional panels to make up for shade losses. During our site assessment of your home, we’ll thoroughly inspect any shading issues and present several solutions. If shading is extensive throughout the whole day, our energy specialist will be very honest in their assessment and not recommend solar. This is part of the reason for our strong online reviews and recommendations by industry professionals. Are there codes or covenants that prohibit solar? The Florida Solar Rights Law limits the effect of restrictive covenants on solar energy systems. In other words, no codes or covenants can restrict the installation of a solar system. Our Energy Specialists check for any codes or covenants that may present a challenge and resolve concerns directly with your covenant director or HOA. What about inspections and permits? We take care of it all! We’ll work with you and your municipality to try and accommodate your busy schedule when getting inspections. Each municipality has its own rules on scheduling and we will find a day that works best for you. Rest easy—we’ve got you covered. Will hail, hurricane or a windstorm damage my system? While there is no guarantee how systems will handle mother nature’s effects, our systems are designed to withstand Florida's tough conditions. Since we install all systems directly to trusses, they've withstood severe weather conditions, including hurricanes that tore off shingles around our solar panels, but left our system intact. In the case of extreme weather conditions, most homeowner's insurance covers the cost of the solar system along with whatever other damage may have occurred to the house or business. Will my photovoltaic system work on cloudy days? Yes, but it will output less electricity than on a clear and sunny day. Photovoltaic panels will produce around half as much electricity when it is cloudy or overcast. If your system is tied to the grid (about 90% of the systems we do are), you’ll pull any necessary electricity from it to complement your system's production on cloudy or shady days. For the most part, however, your meter will run backwards whenever the system produces more energy than you use. How are you mounting the system onto my roof? Is it going to create leaks? This is just one area Superior Solar really prides itself: Unlike competitors, our mounting systems are installed into the structure of your home or building, right into the truss below the roof. This keeps the roof sealed and prevents the system from moving or creating holes. If there are any cases of penetration, it is completely covered under your warranty. Our mounting system has proven to be the most reliable and safe method of solar installation in the industry, which is why roofers consistently recommend us over the competition. What features should I choose for a solar energy system? 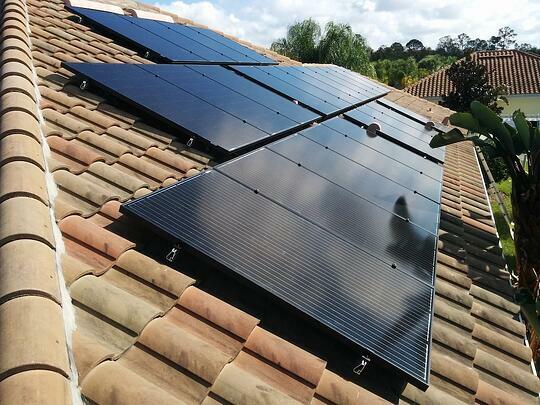 There are a variety of features available with Superior Solar energy systems. The most popular is a wireless in-home monitoring system, which allows you to track the output of your system and see how much electricity your panels are producing at any time. Talk to one of our solar experts about these additional. What do Watts, Kilowatts (KW) and Kilowatt Hours (KWh) mean? While these metrics can get confusing, you only need a short consultation with one of our knowledgeable energy specialists before you become an energy expert! This depends on how much electricity your home or building uses, the size of your roof and what percentage of energy use you want to produce with solar. Solar energy system sizes for residential homeowners usually range from 2 kW to 10 kW. Commercial systems can range from 25 kW to well over 100 kW. This is a good question. Living in Florida with solar-friendly laws, rebates and lots of sunlight, the answer is usually yes. With a free consultation from one of our energy specialists, we can quickly determine if your home or business is a good candidate for solar. Often, this can be done through a phone conversation and a satellite photo analysis. Why should I buy a solar energy system from Superior Solar? Three reasons: Quality, Experience and Integrity. 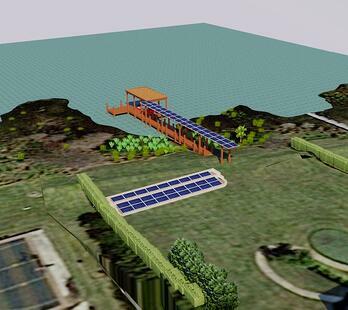 We don't just put a solar energy system on your property and leave it at that. We want you to get the most out of your new investment. We provide several comprehensive services to optimize your new system and work with you on every detail of the system to deliver a customized product that meets all your wants and needs. We can install systems while you’re at work and most of our installations last only 1 to 2 days. Our installation team is one of the most experienced in the state. With over 20,000 jobs and many years of experience, they are truly craftsmen with a keen eye for quality and aesthetics. They’ll make sure your project looks as good as it works. Learn more at our About page. Will the system perform reliably or will it break down frequently? Our systems are guaranteed to be reliable and functional. With little to no moving parts, solar is very dependable and durable. This mature technology delivers a virtually unaffected uptime and continuous flow of clean and efficient electricity to your home or business. For solar pool heating, competitor systems require annual maintenance to tighten clamps on hose connections and fix torn straps. Our patented Heliocol panels require zero annual maintenance and provide a lifetime of trouble-free functionality. They save a tremendous amount of energy and also save over $100/year of maintenance fees charged by our competitors. There are reports of systems made in the 1960s that still work today and there are studies estimating a system built today with modern components can last up to 50 years. With no moving parts and highly durable materials, solar panels are virtually indestructible and built to last! All of the PV modules we install have a 25 year Manufacturer Production Guaranty. However, it’s very possible that your system could produce electricity for 30, 40 and even 50 years. Is it hard to clean and maintain a solar energy system? Not at all. Our solar energy systems require very little maintenance. Manufacturers recommend periodic system checks and cleaning as part of a preventive maintenance routine. This includes regularly clearing away any debris and cleaning the solar panel surfaces exposed to the environment, which should be performed more often if the environment is particularly dirty. Usually a garden hose does the trick. For solar pool heating, competitor systems require annual maintenance to tighten clamps on hose connections. Our patented Heliocol panels require zero annual maintenance and provide a lifetime of trouble-free operation. Do your systems include a warranty? What about the installation? What are some things that aren’t covered in the warranty? Nature and acts of God are not covered under any manufacturer warranty. Prior to installation, a survey of existing condition of the buyer’s property (such as the roof and electrical equipment) will be conducted to insure a proper installation. Simple homeowner maintenance and inspections are required to ensure the system will last for many years. What if I may be too old to get my money back out of my investment? You’re never too old to save money! Solar systems add value to a property, increasing the resale. Pus, we have financing options that ensure your savings are higher than your costs. Can I finance the cost of a solar energy system? Absolutely. We have close relationships with local banks and lending companies that offer very attractive loans for solar energy systems. We will discuss all available financing options with you before your purchase and work to find the best financial solution for you. In general, the payment amount is at or below what you would normally pay for the electricity. This allows you to lock in today's energy rates for the future; as the price of electricity rises, your payments will stay the same. At the end of your loan, all further production will be free. For more information on residential financing options, click here. For information about commercial financing options, click here. What incentives and rebates are available from the state or government? Residential and commercial customers receive a 30% federal tax credit. For commercial, there is no cap on the tax credit and solar costs can be depreciated over 5 years (accelerated depreciation). Other local incentives are available depending on your specific address. Our Energy Specialists will share applicable incentives with you and walk you through the application process. Note that some of these incentives, including the 30% federal tax credit, were set to expire in 2015 and 2016, so please review any tax credit details for expirations or renewals of options. What does a typical solar energy system cost? This can vary greatly depending on the site (roof condition, slope, orientation to the sun etc.) and, of course, the size of the system. As a general rule, the larger the system, the lower the cost per watt. Contact us for a free estimate on the proper system for your home or building. How much money does using energy efficient lighting and appliances really save me? Every dollar you spend on making your home more efficient saves you approximately $3 in energy costs. Contact one of our energy specialists for a site-specific evaluation of what solar can do for you. Are there any additional operating costs of running the pool system? There are zero operating costs to run a system because only the renewable energy from the sun is used to heat your pool and there is no additional energy needed to power the system. The only “extra” cost you’d be paying is the added energy of running a pool pump (which is part of any pool heating system). However, we offer an energy efficient variable speed pool pump that can save you even more money. How much warmer can I expect my pool to get with a solar pool heater? We typically size systems to deliver a desirable swim temperature of 80 degrees or higher. Your energy specialist will take your needs and the specific conditions of your home or building into account when designing the solar system. Do I need to use the pool blanket? Yes. When air temperature is below 60 degrees, it’s best to use the pool blanket to trap in the heat that was produced during the day. A pool system adds a few degrees each day and the blanket helps prevent that heat from escaping at night during colder weather. What makes the Heliocol system different than other pool heating systems? 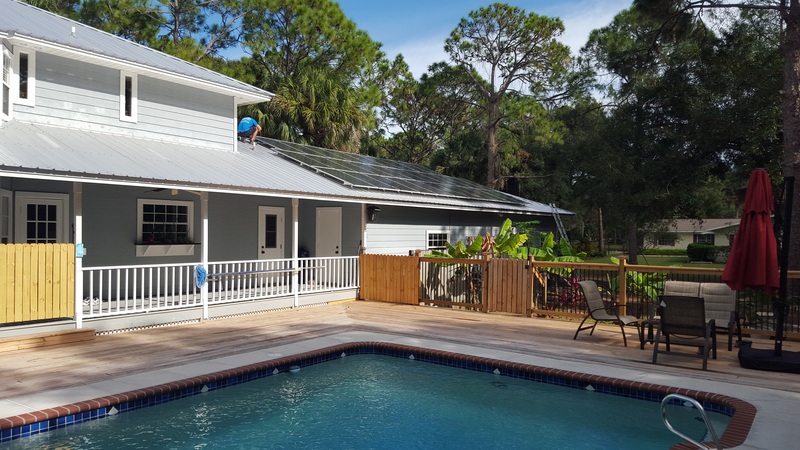 Heliocol solar panels produce more energy, last longer and are better suited for Florida’s climate than any other solar pool product on the market. Heliocol systems have patented mounting methods that allow for direct mounting onto the trusses of a roof. Other systems cannot guaranty truss connections and often cause leaks in roofs. That’s why so many roofers recommend us and that's why it’s the only system we offer. Click here to learn more about Heliocol solar panels. How can I get rid of rodents, such as squirrels, going after my pool system? For nuisance rodents, it’s best to hire a trapper to remove the pest problem. Do I have any financing options for solar pool heating? Of course! We have close relationships with local banks that offer very attractive loans for solar energy systems. You can actually go solar now with $0 due upfront by taking advantage of our great financing options. For residential financing information, click here. For commercial financing information, click here. What does the warranty for the pool heating system cover? Our manufacturer’s 12-year warranty covers the panels for defects in manufacturing and freezing, including parts and labor. See warranty for details. What do I do with my solar water heater when I go out of town or get a hard freeze in the winter? We have a great video that best answers this question. Click here to watch it! Are there any financing options for solar water heating? Yes! We have close relationships with local banks that offer very attractive loans for solar energy systems. You can go solar now, with $0 due upfront, by taking advantage of our great financing options. What does the solar water heating warranty cover? Our solar water heating warranty covers parts, panels and labor for one year after installation. In addition, we warranty roof penetrations as long as you own your home. Do I have the ability to produce extra electricity and sell it to the utility company? Yes. And they are forced, by law, to purchase it. We can discuss options to create a system large enough that covers all of your electricity and still produces enough energy that can be sold back to the utility company. Why do you recommend replacing our existing water heater with solar before installing the PV solar system for electricity? Firstly, we want to save you as much money on your existing electricity costs as possible and a solar water heater will reduce the size of the solar electric system and its cost by 30%! Secondly, we want to maximize the output of your solar energy system. With a decreased household energy load, your system will produce a higher percentage of your electricity need, which can drastically decrease the system’s payback period. When my power goes out, can I still use the power from the solar electric system? This depends upon whether you have a backup battery option: when the grid goes down, the system automatically disconnects and shuts down for power grid operator safety. With a backup energy storage solution, you’ll have enough power for lights, small appliances, running your refrigerator and charging your cellphone. Feel free to ask one of our energy specialists about your backup battery options. Are there any financing options for solar electric PV? Absolutely. We have close relationships with local banks and lending companies that offer very attractive loans for solar energy systems. So, you can go solar now with $0 due upfront by taking advantage of our financing options. What does the warranty cover for solar electric PV? Our solar electric warranty covers parts, panels and labor for one year after installation. The panel manufacture provides a 25-year limited warranty that includes panel performance. Undoubtedly the most reliable and fair minded photovoltaic solar installers in the area.